Full time – Fixed term to March 2021 – £33,199 to £39,609 p.a. Applications should be submitted by 23.59 (UK time) on Sunday 31 March. The UK Centre for Polar Observation and Modelling (CPOM) is hiring a research fellow in Sea Ice Altimetry, with a focus on investigating historical and ongoing changes in the Arctic and in Antarctica. CPOM provides UK national capability in satellite observations and numerical models of the polar regions in partnership with the British Antarctic Survey (BAS) and the National Oceanography Centre (NOC). We also work closely with the European Space Agency (ESA) and the European Commission on current and future satellite missions, providing scientific leadership for CryoSat-2 and Sentinel-3, as well as many other national and international partners. The CPOM Directorate is based in the School of Earth and Environment at the University of Leeds, with staff distributed across the UK. In this role, you will lead a programme of sea ice research, focusing on measuring and monitoring trends in its thickness and volume in both hemispheres. This will involve exploiting recent developments in satellite radar altimetry and using other Earth observation and climate data records. You will also contribute to CPOM’s overall radar altimetry work programme, promoting the integration of sea ice altimetry with other research interests and themes, and working on methodological advances such as developing and evaluating estimates of snow loading. Although based in Leeds, you will work with scientists across our partner universities, including CPOM’s sea ice modelling team at the University of Reading. In addition, you will liaise with our partners at ESA, BAS, NOC, the UK Met Office and other institutions as appropriate to contribute to CPOM’s scientific objectives. As well as having (or being close to completing) a PhD in a relevant subject such as physics, mathematics, computer science or engineering, you will also have a strong publication track-record; experience of working with satellite radar altimetry and climate data; an enthusiasm for scientific research and problem-solving; excellent communication and interpersonal skills; and the ability to work as part of the wider CPOM team. For more information, and to apply for this role, please visit the Leeds University jobs website. Applications should be submitted by 23.59 (UK time) on Sunday 31 March. I left the UK last Saturday and flew to Punta Arenas in Chile. There we waited (with various, BAS, NOC and university colleagues) to board the RRS James Clark Ross; a few days later we departed for the Falkland Islands. On board our first task was to lash down all the equipment in the ship’s laboratories needed for our sampling and familiarise ourselves with the layout of the ship. We have been accompanied for most of the journey so far by a variety of birds and mammals, including magnificent black-browed albatross, that mostly just sit in the water surrounding the ship waiting for food (to upwell from beneath the ship). Carol in front of the RRS James Clark Ross in Stanley. After three days sailing we docked at Stanley, Falkland Islands. We were unexpectedly granted 3 hours shore leave so some of us disembarked (even after 3 days of an 8 week cruise it was great to be on land! )…The Falklands bright and breezy as its late summer here. We walked to nearby Gypsy Cove, the most accessible wildlife site from the capital city. It is part of the Cape Pembroke peninsula which is a National Nature Reserve. The small bay with its white sandy beach is sheltered from prevailing winds and is home to good numbers of Magellanic penguins who breed here, nesting underground in burrows. Carol Arrowsmith is currently part taking in an expedition to the Southern Ocean as part of ORCHESTRA (Ocean Regulation of Climate by Heat and Carbon Sequestration and Transports), a NERC- funded programme with partners at the British Antarctic Survey (BAS) (lead), the National Oceanography Centre, (NOC) Plymouth Marine Laboratory, and many more including BGS. ORCHESTRA is in the third year of a five year collection programme around the World’s oceans. I will be collecting samples from the RRS James Clark Ross. I will be tweeting @CarolArrowsmith and @ORCHESTRAPROJ and on Facebook (Orchestra project) along the way, as well as updating the BGS Geoblogy. Carol Arrowsmith is a chief technician in the stable isotope facility at the BGS. 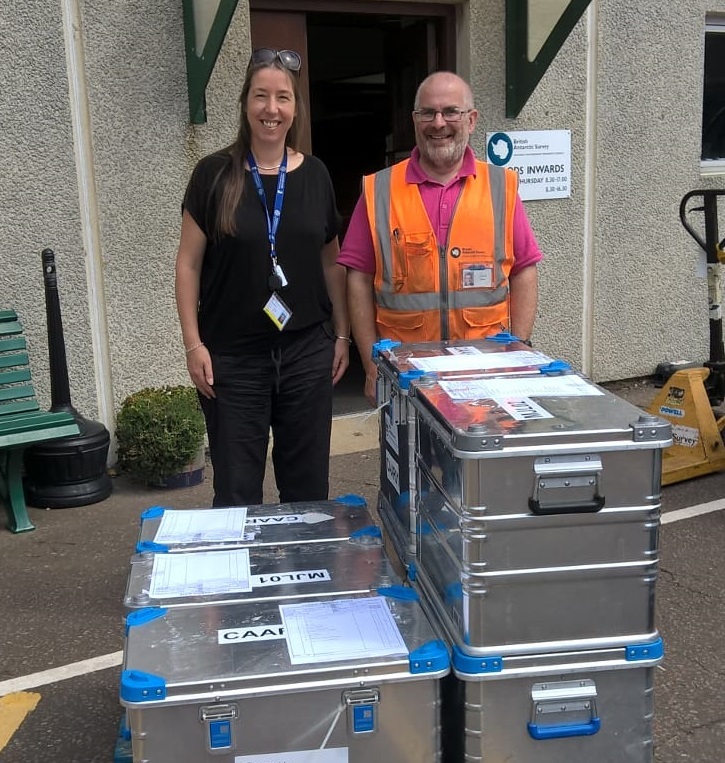 In a few days I will be embarking on my leg of the major NERC project called ORCHESTRA (Ocean Regulation of Climate through Heat and Carbon Sequestration and Transport) to collect seawater samples for isotope analysis. My leg is called ANDREX II – Antarctic Deep Water Rates of Export (ANDREX), and is the second time this part of the ocean has been sampled. I will be boarding the RRS James Clark Ross in Punta Arenas and following a stop off in the Falklands will start sampling from the tip of the Antarctic Peninsula along the 60°S parallel and across the Southern Ocean to 30°E, before returning to the Falklands in mid April. ORCHESTRA is a five-year collection programme around the World’s oceans. I will be collecting samples from the RRS James Clark Ross. I will be tweeting @CarolArrowsmith and @ORCHESTRAPROJ and Facebooking (Orchestra project) along the way, as well as updating the BGS Geoblogy. Carol Arrowsmith is a chief technician in the stable isotope facility at the BGS. There will be two sessions on the Southern Ocean at next year’s EGU General Assembly (7-12 April 2019). The submission deadline for abstracts is 10 January 2019, 13:00 CET. 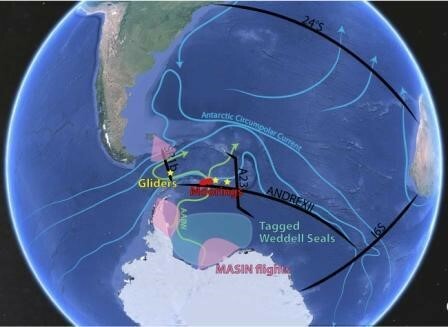 The Southern Ocean around the latitudes of the Antarctic Circumpolar Current is a key region for the uptake, storage and lateral exchanges of heat, carbon and nutrients, with significant impacts on the climate system as a whole. The role of the Southern Ocean as a sink of anthropogenic carbon and heat and as a source of natural carbon in present and future climate conditions remains uncertain. To reduce this uncertainty, understanding the processes underlying the Southern Ocean internal variability and its response to external forcing is critical. Recent advances in observational capabilities, circulation theories, and numerical models are providing a deeper insight into the three-dimensional patterns of Southern Ocean change. This session will discuss the current state of knowledge and novel findings concerning the role of the Southern Ocean in past, present and future climates. This includes e.g. studies of physical, biological and biogeochemical ocean processes as well as of ocean-atmosphere interactions. In recent years the interaction between the ocean and the cryosphere in the marginal seas of the Southern Ocean has become a major focus in climate research. Questions such as “Why does Antarctic sea ice not decline?”, “What controls the inflow of warm water into ice shelf cavities?”, and “How does this affect ice sheet stability and sea level?” have attracted scientific and public attention. Recent advances in observational technology, data coverage, and modeling provide scientists with new opportunities to understand the mechanisms involving ice-ocean interaction in the far South much better. Processes on the Antarctic continental shelf have been identified as missing links between the cryosphere and the deep open ocean that need to be captured in large-scale and global model simulations. This session calls for studies of the Southern Ocean’s marginal seas including the Antarctic continental shelf and ice shelf cavities. Physical and biogeochemical interactions between ice shelves, sea ice and the open ocean are of major interest, as are consequences for the greater Antarctic climate system. This includes work on all scales, from local to basin-scale to circumpolar. Studies based on in-situ observations and remote sensing as well as regional to global models are welcome. We particularly invite cross-disciplinary topics involving physical and biological oceanography, glaciology or biogeochemistry.